Oh Kickstarter, with your siren song of seductive games coming our way slowly. Whether you offer us some computer games, board games, card games or role-playing games, you always have a way to get money out of our pockets with promises of games that are even better than the last ones we got not too long ago. Of course, any sensitive gamer will look at just who designed the game and who is producing it before backing a project, but sometimes, just sometimes the promise is too good to pass up. Luckily for me, the projects I backed this last week are from established companies and one of them even comes from a well-accomplished designer. 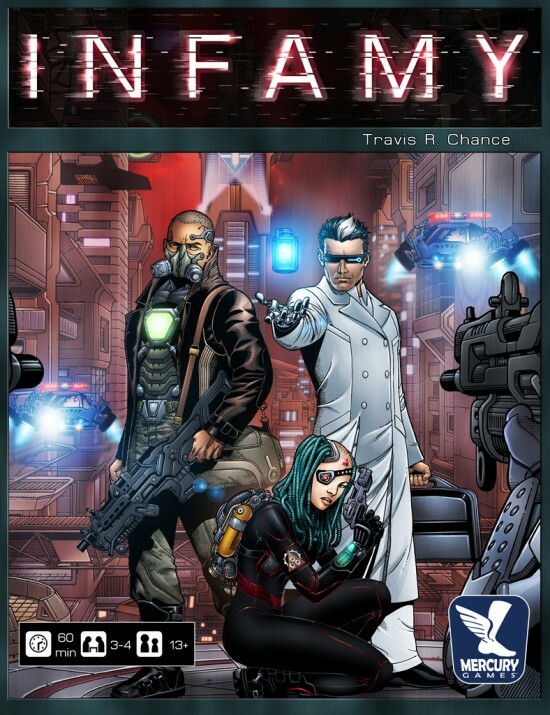 The first game I Kickstarted this week is Infamy (Mercury Games) by Travis R. Chance, a first time designer. What drew me to back this project? Well, I’m a sucker for a certain type of Cyberpunk or any kind of near future theme and there’s just not enough of these games around. Also, the mechanics seemed interesting (limited amount of “bribe” tokens to bid on 5 items, with each bid taking away an additional token), using a small twists which brought something new to the table. The aspect of simultaneous action selection, leading to gaining respect in one of the three factions, which bring you closer to victory and also seem to grant you special powers look very interesting. The artwork is also really good, which also helps. Should be interesting to see if it can actually meet its goal, and if it does, how good the game will be. I love card games, and I’m fascinated by what can be done with a regular deck of card or with poker hands. Add in some combat and color me intrigued. 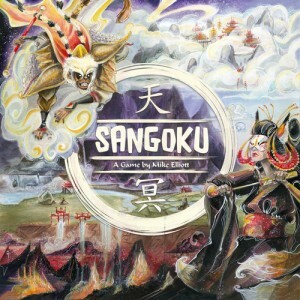 Sangoku (Game Salute) by Mike Elliott (designer of Quarriors, Thunderstone and Agent Hunter, amongst others) does just that, mixing poker hands with simple army management. The game looks light enough to make for a quick filler but still have some interesting decision making. The art is, again, gorgeous, very evocative of the theme, which I’m not sure I can say the same about the mechanics. Count one more interesting game coming from Game Salute, who seem to be on a roll lately. They’ve met their goal handily as it was set very low, but nonetheless they blew right pass it. This entry was posted in Kickstarter and tagged infamy on September 8, 2013 by TopDog.